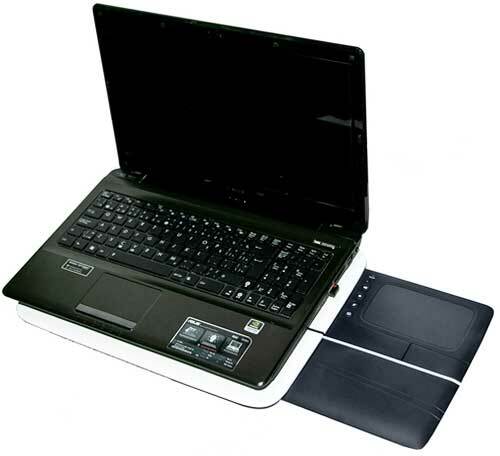 The lapdesk may not be perfect, but with its unique combination of features, the N600 makes a very good option for those who regularly use their laptop away from their desk even with its minor quirks. A laptop is rarely used at a desk, and for most of the time it is going to end up on your lap or on your chest, or even on the sofa next to you. This is why they are called laptops in the first place. Unfortunately, laptops are designed in such a way that they need to have some distance between the bottom of a laptop and the surface you’re using it on. This is because the bottom can get uncomfortably hot and need some air space to keep from burning parts of you. To keep from getting burned, people use everything from blankets to pillows to book-bags, but these are less than optimal solutions as they are too soft and can block the intake / exhaust ports. They can in turn make your laptop’s internal temperatures skyrocket and thus reduce the lifespan of the device. The perfect solution is to carry around a small desk with you, but even a small TV tray is bulky and not exactly a great solution either. This is why Logitech created their Lapdesk line as they basically are small portable desks that sit on your lap. The Lapdesk N600 may not have a built-in fan and a pair of speakers like the N700, but it does not need them. 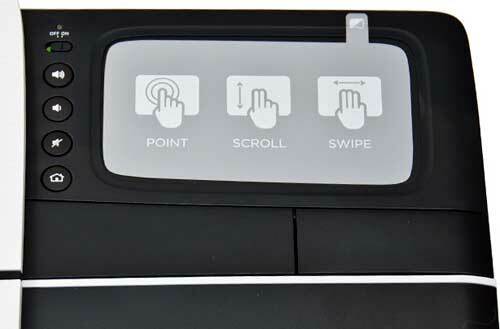 This Touch Lapdesk N600’s main claim to fame is the pull out tray built into the right side of the device. When you pull out this tray, you are greeted to a large hand rest area which takes up the lower half of it; with the top half consisting of two oversized left and right buttons, a row multimedia keys and a large 5″ touchpad. Even though the multi-touch touchpad looks small on this large tray, it does provide you with a full 5″ worth of area. If you use one finger, it acts as a pointer; two fingers for scrolling through pages; and three fingers for the “forward” and “back” thumb buttons of a mouse. The genius of this design is that when you are reclined in bed or even just sitting up in a chair, your right hand will naturally fall to this pull out tray. As an added bonus, since multi-touch pad stores inside the N600, it is full protected during transport. While the touchpad and its pull-out tray are the star of the show, the Lapdesk portion of the N600 is just as important. As such, the top of this unit is covered in a very gripy rubber with nice textured swirls added into it. In fact, the rubber top may be too sticky as everything sticks to it, including dirt, lint and other less than desirable items floating around in the air. This brings us to my biggest complaint about the N600: it is hard to keep clean. Where the top surface is so sticky, you will want to keep a cleaning cloth handy. Cleaning the N600 is difficult as it does not want to give up anything that has attached itself to it. The top has been fully thought out, yet the same can not be said of the bottom. There is a nice storage (for the nano-transceiver) and battery compartment on the base, but the base is made not only from smooth plastic and has not been contoured in the least. There are two long – but thin – rubber strips running the width of the base, but the N600 is more likely to slip around on your lap. Having said that, the base does need a bit more work as even some minor contouring to let it mold to your legs would have alleviated most of this pitfall. On the positive side, the bottom will not be as big a lint and dust magnet as the top is. Again, the Lapdesk N600 is only meant for laptops that are 15″ or smaller. Before I move on, there is one last feature worth pointing out: the dimensions of the N600. This device is meant for 15″ and smaller laptops, so if you have a 17″ model, this is not for you. This is pretty much par for the course as those large models are more desktop replacements than anything else and not meant for travel. With a thickness that is less than a package of Hall’s lozenges, it really is easy to find room in even an over-stuffed laptop bag for the N600. Overall, it may not be perfect, but the N600 Touch Lapdesk certainly has a nice feature set that will make it attractive to many consumers. Let’s install it, get it up and running and see if all this potential has been put to good use. Installation of the Logitech Lapdesk N600 is simplicity incarnate. 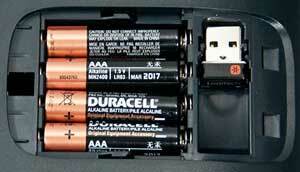 The 4 AA batteries come pre-installed and all you need to do is remove the two large plastic strips insulating them from the contact points. With this done, you plug in the USB nano-receiver, slide out the small side tray and turn the device on. After a moment, Windows will recognize it and install the needed drivers. The Logitech N600 is seen as nothing more than another input device and there is no need for special software. The inhernet downside to this is that the Logitech SetPoint software does not work with the N600 Lapdesk so you will not be able to do much modification / tweaking to any of the buttons. 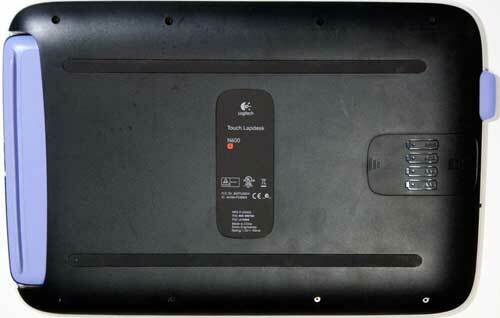 As the receiver is part of the Logitech’s Unifying technology, you may not even need to plug in the receiver. I actually did not as my Comfort Wave keyboard also is Unifying-compliant and thus both devices were able to run off the same receiver with no issues. After testing the Lapdesk N600 for a period time, it really is impressive how big a difference a device like this can make to your day-to-day usage. In the past, I would balance my laptop on top of everything from a cushion to the top of our thighs and I thought this was good enough. When I’ve started using the N600, I quickly realized how much time I wasted worrying about the laptop overheating, keeping it balanced and not falling off my laps. As mentioned earlier, the base of the Lapdesk N600 is indeed not perfect. While the two thin strips do an adequate job of keeping it anchored to whatever I had the Lapdesk N600 on top of, there were times when I wished for even more surface grip. This was most especially prevalent when I was reclined on the sofa or in bed using our laptop. In this case, the N600 did slip and slide all over the place. To be blunt, I probably will grab some extra grip tape from a hardware store and cover the bottom of this device with it. That way, no matter how much of an incline our stomach or legs are in relation to the horizontal, the N600 will not move. As for the touchpad, I do wish it was larger as I never felt the need to connect a mouse or trackball to our laptop. This certainly was a unique experience for me as my laptop’s touchpad just doesn’t cut it. The ability to use one, two or three fingers and have the same motions do three different things is not only very intuitive but also quickly becomes second nature to most of us. The only real issue with the slide out touchpad is that it does flex a disturbing amount if you rest your hand on it. While the Logitech N600 Touch Lapdesk is far from perfect, it is a very good device nonetheless. It is quite portable with its petite dimensions and it is light enough to put on laps for extended periods without much discomfort. 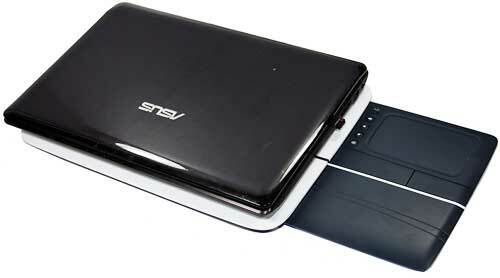 Having said that, the N600 is not as comfortable to use as the more costly N700 Lapdesk with the contoured base. It is also only moderately stable since there are only small grip strips to keep the N600 in place. For the price, the ease of use and multi-touchpad do make the N600 a very good companion to any sofa, bed or other place you would need a small desk for. It keeps your laptop’s temperature from skyrocketing and its large enough touchpad makes needing a mouse or other secondary peripheral unnecessary for most tasks. It may not be ideal for all situations but the N600 is a very good overall solution. Once you get used to its minor design quirks, you will likely find the N600 Touch Lapdesk a good investment.